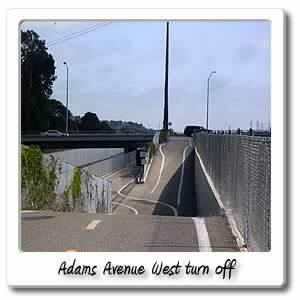 Welcome to Adams Avenue on the Santa Ana River bicycle trail. 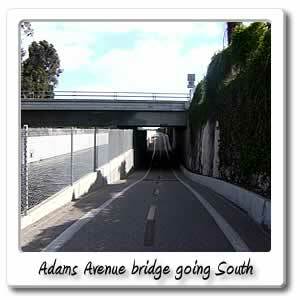 At three miles from the beach, and 15 minutes later, you'll find the Adams avenue bridge. 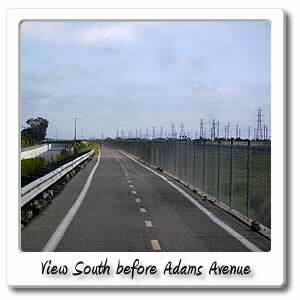 If you make a left or go west you'll be in Huntington Beach still, if you continue on Adams for half a mile, you'll come up to Brookhurst Street. All four corners of the intersection has something to offer. You'll find a Stater Bros. Market, Lamppost Pizza, US Bank and other shops. At the other corner you'll find a Starbucks, Pizza place, CVS Pharmacy. At another corner you'll find a Target and a Bank of America, and other shops. At the other corner you'll find a Wells Fargo and Polly's Pies. If you go right or east off of the bridge, you have to go a mile and a half, before you get to a major intersection which is at Harbor and Adams. You can find a Coco's, Citibank, and Radio Shack. On the other corner you'll find a Boston Market, Union Bank, Acapulco Mexican Restaurant, and other shops in the large shopping center, such as a Vons and Starbucks. On the other corner you can find a Carl's Jr. and other shops. If you continue east on Adams you'll find Orange Coast College. 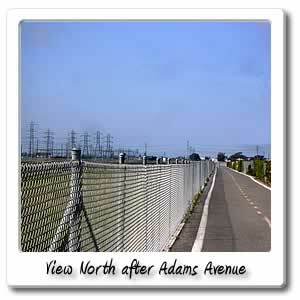 The next entry/exit point is Gisler Avenue.